The 2018 Jeep Cherokee speaks to drivers that want more from the average compact SUV. Merging a great design with unparalleled drivability, the 2018 Jeep Cherokee is full of the latest technology and it has generous space for all passengers. Strap in for adventure when you take a ride in a new 2018 Jeep Cherokee. 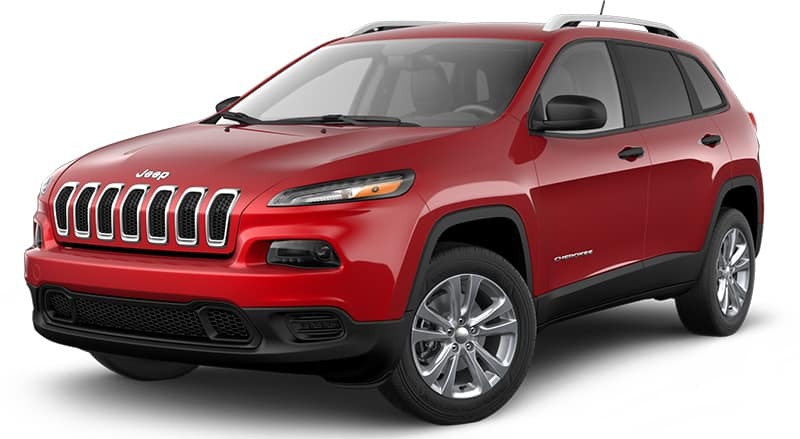 The 2018 Jeep Cherokee is available with two engine options and in five trims, the Cherokee Latitude, Cherokee Latitude Plus, Cherokee Limited, Cherokee Overland and Cherokee Trailhawk. Four of the Cherokee trims (Cherokee Latitude, Cherokee Latitude Plus, Cherokee Limited and Cherokee Overland) are available with a 4×2 or 4×4 drivetrain, and the Cherokee Trailhawk, a trim designed specifically for off-roading, is only available with a 4×4 drivetrain. Also, the Cherokee is available with three different 4×4 drive systems. The new 2.0L engine on the 2018 Jeep Cherokee includes a 48-volt mild-hybrid eTorque system, that is phenomenal for fuel economy and power. As we know, electric motors are known to generate a lot of torque at low RPMs. That comes in handy when making using of the Jeep Cherokee’s 4×4 system, Active Drive I or Active Drive II, both full-time 4×4 systems capable of taking on any kind of terrain in all sorts of driving conditions. The 2.4-liter I-4 MultiAir engine offers drivers the perfect balance of power and fuel efficiency and it is standard on all Cherokee trims, except for the Cherokee Overland 4X4. The 2.4L engine produces 184 horsepower and 171 lb-ft of torque and it gives the Cherokee a maximum towing capacity of 2,000 pounds. Thanks to the engines efficiency and the nine-speed automatic transmission, when the Cherokee is equipped with the 2.4L engine it has an average fuel economy of 21 mpg in the city and 30 mpg on the highway. The other available engine option is a 3.2-liter V6 engine and it comes standard on the Cherokee Overland 4×4 and it is an available upgrade on all of the other Cherokee trims. The 3.2L engine boosts the vehicle’s horsepower and torque to 271 horsepower and 239 lb-ft of torque and it increases the Cherokee’s towing capacity to 4,500 pounds, giving the 2018 Jeep Cherokee a best-in-class maximum towing capacity. The 3.2L engine is paired to a nine-speed automatic transmission and it has an average fuel economy of 18 mpg in the city and 24 mpg on the highway. Jeep drivers will notice the power of their 2018 Jeep Cherokee while driving anywhere. With excellent handling that makes for an enjoyable ride. With the Wrangler’s unique ability to go off-road and traverse the toughest terrains, the 2018 Jeep Wrangler provides excellence in driveability. The 2018 Jeep Cherokee has a history of adventure with innovative style and pushes boundaries with an exterior design that provides maximum aerodynamic efficiency. Also included are daytime running lamps, signature LED lighting and a large spoiler. The curvaceous rear tailgate adds to the vehicle’s dynamic styling and exterior look, which can be characterized as modern and sleek. Other trims like the Cherokee Trailhawk or the Cherokee Limited have some upgraded standard features that are available options on other Cherokee trims. Some of the available upgrade features include, leather seats, leather-wrapped steering wheel and shift knob. The optional exterior features include, larger wheels (17-inch and 18-inch), My Sky Fixed/Removable panels, fog lamps, and power heated mirrors. A beautiful ride on the outside as well as the inside, the 2018 Jeep Cherokee has standard fold flat rear seats that are wonderful to provide more space for storage, back-up camera features and rear bench seats. With multiple USB inputs, audio and cruise controls direct from the steering wheel, trip computer and aux audio inputs. Leather or cloth seating is available as well for the base model. The Tech Connect package is available with a 115-volt power outlet, which comes standard on the higher trims (Trailhawk, Overland) and voice commands from the steering-wheel controls are standard with every 2018 Jeep Cherokee. The 2018 Jeep Cherokee Trailhawk comes standard with dual-zone automatic climate control. The 2018 Jeep Cherokee provides an amazing amount of modern amenities, like Bluetooth capabilities, AM/FM SiriusXM satellite radio and an 8.4 inch touchscreen with the Uconnect infotainment system. Various trims provide more features others. A new feature for the 2018 Jeep Cherokee is the ability of pairing the infotainment system with Amazon Alexa, to remotely start or stop the engine, lock and unlock doors and even program the navigation system. Every 2018 Jeep Cherokee has a variety of premium safety features to keep the driver and passengers safe when off-roading or in case of a collision. The 2018 Jeep Cherokee provides standard advanced multistage airbags, supplemental front seat-mounted side airbags, supplemental side-curtain front and rear airbags and supplemental rear seat side airbags. There are also a few different advanced safety features that assist and help drivers avoid accidents. Some of the available advanced safety features include cross path detection, full-speed collision warning with crash mitigation and blind spot. The 2018 Jeep Cherokee has a starting MSRP of $24,394 (plus destination fee). Jeep ensures every model with a three-year or 36,000-mile limited basic warranty, a five-year or 60,000-mile limited powertrain warranty and offers complimentary roadside assistance for five years or 60,000 miles. Hollywood Chrysler Jeep is located just outside of Miami, and we have a great selection of Chrysler and Jeep vehicles. Visit us at Hollywood Chrysler Jeep for a test drive of the brand new Jeep Cherokee today.